Last week we talked about Grand Canyon National Park, one of the best known and most visited national park units in the system, attracting over 5 million guests each year. But on our way there, we stopped by Walnut Canyon National Monument. This hidden gem, 10 miles southeast of Flagstaff Arizona, has far fewer visitors, just over 150,000 guests each year. Did you know that there are walnut trees in Arizona? That’s where Walnut Canyon got it’s name. 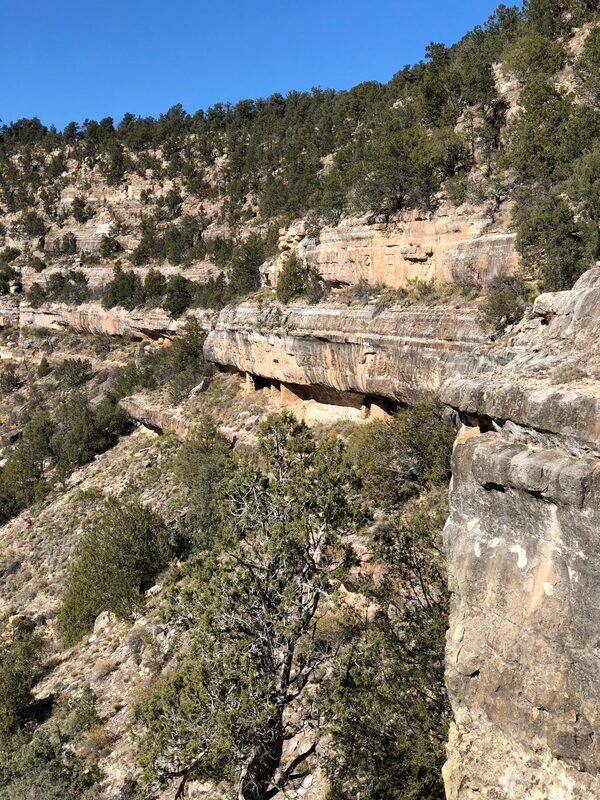 This lush canyon at over 7,000 feet was the home of ancestral Pueblan people between 1125 and 1250. They built their homes up against the cliff walls using natural rock overhangs for protection. Today you can walk along the path and see how well built these homes were, with small doors and vents for smoke. 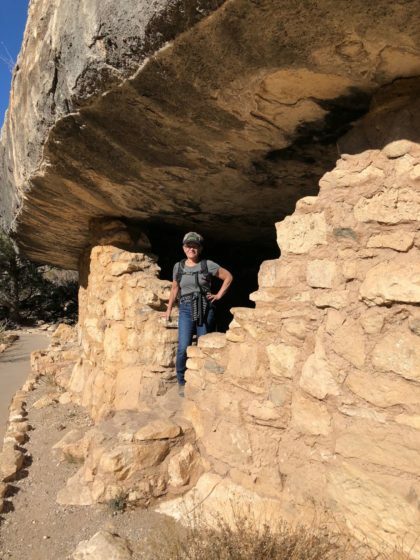 Unlike many of the cliff dwellings you will see at other national park units, at Walnut Canyon you can actually go into some of them and visualize what it may have been like to live there. We are fortunate that in 1915 Woodrow Wilson preserved these dwellings by declaring the area a National Monument. Prior to that, souvenir hunters had been plundering the area for artifacts. There is one dwelling today where they point out where folks had blasted the walls to more easily access pottery and other Indian artifacts. It was interesting to learn from the ranger that making this a national monument didn’t 100% protect it. She told us that in the early days, the park ranger actually collected artifacts and sold them as souvenirs. Boy, has the National Park Service ever evolved. 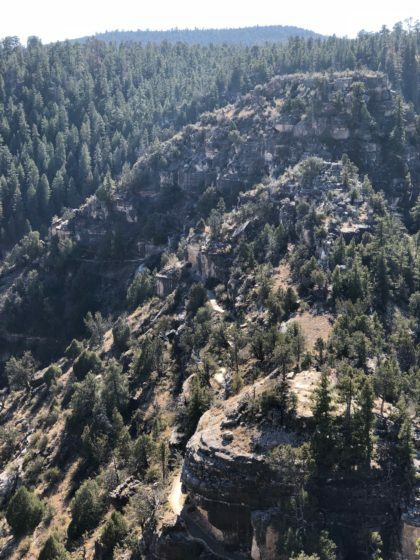 There are two trails at Walnut Canyon National Monument: the Island trail, 1 mile round-trip paved path that takes you among the cliff dwellings and the Rim trail, a 3/4 mile trail at the top of the canyon. The Island Trail is more strenuous. You go down 273 steps (185 vertical feet) and then walk out along the “island” with cliff dwellings built on top and all around; some on the sunny side and some on the shady side. We asked the Ranger if they moved from side to side with the seasons and she said that no one could be sure because there is no written history. Some speculate that they did move to the shady side during the hot summer; others believe that families lived in the same place year round. The Rim Trail stays up at the top and is a fairly flat paved trail. 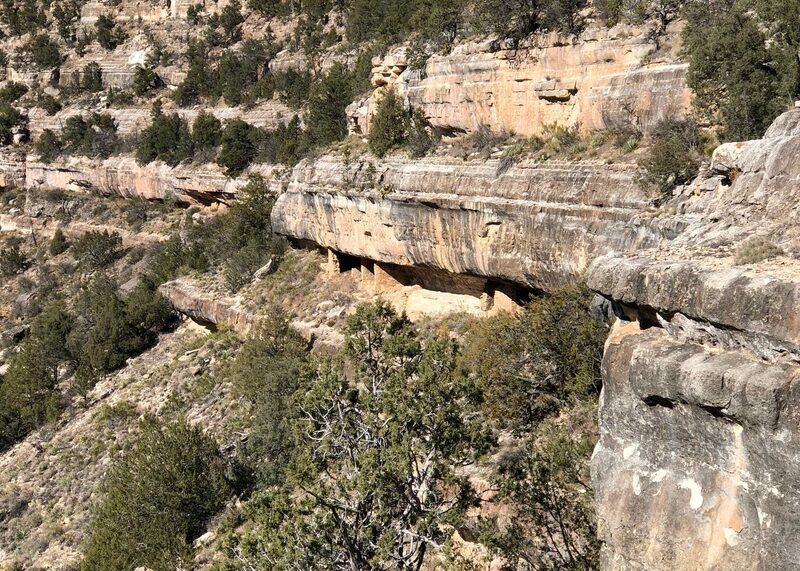 It offers great views out over the canyon, where you can see the many of the dwellings built into the canyon walls. 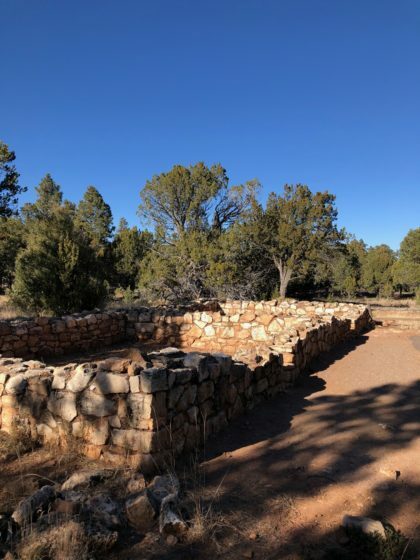 There is also an excavated pit house and the ruins of a 2 bedroom pueblo up on the rim, built around 1100. There is also an example of how these people farmed. The Sinagua people (Spanish for “without water”) were dry land farmers, growing crops on the poor soil on the canyon rims, then hunting and gathering to supplement their diet. It was really interesting to learn how they grew crops. They planted in a circle, with corn in the middle, then beans planted around them so they could climb on the corn, and squash around that to provide ground cover to keep in the water and also provide a natural pesticide. Across the southwest you will find many examples of ancient cultures. 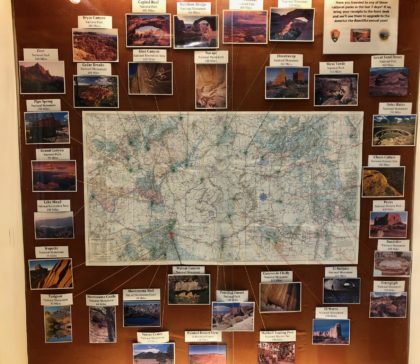 There is a great map in the visitor center that shows the various places: Wupatki National Monument in Arizona; Mesa Verde National Park and Hovenweep National Monument in Colorado; Gila Cliff Dwellings National Monument and Chaco Culture National Historical Park in New Mexico, and more. No one knows exactly why they left these places. We read that Hopi tradition says that Walnut Canyon was just “one step in a larger journey and ultimately not the final destination for these people”. But no one really really knows from where they came or where they went, or why. It’s just part of the mystique of these ancient places.